In Love With Handmade: 2016 Challenges: Tamora Pierce Challenge hosted by Read Write Love 28!! 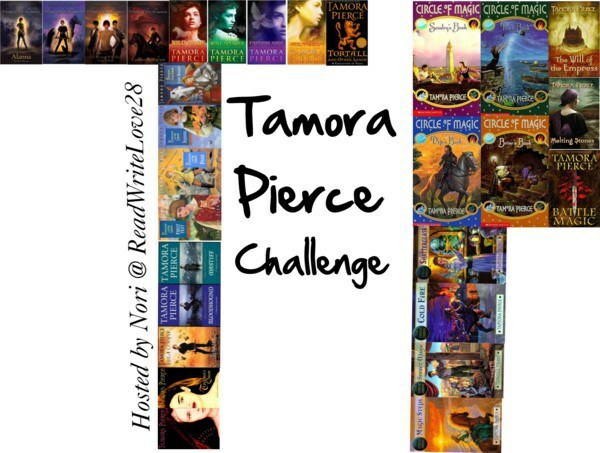 2016 Challenges: Tamora Pierce Challenge hosted by Read Write Love 28!! Aside from running around and being absolutely unbearably excited today because tonigth after work I'm going to the midnight release of THE FORCE AWAKENS and nothing could make this Star Wars massive geek happier, I'm continuing with my challenges for 2016 posts! I discovered my love for the Tamora Pierce this year, because till October I had seen many people spreading their love for them but it was Gillian's post about the Tortall books that made me grab the Alanna Quartet for my Kindle and absolutely devour them! Then I re-read Alanna, The First Adventure for The Midnight Garden Classic & YA Readalong and when I was going to continue re-reading the other 3 books, Nori from Read Write Love 28 told me to wait! As it happens she was plotting to host a very awesome challenge for 2016, the Tamora Pierce Challenge! HERE is Nori's post with the link to sign up for the challenge! For the challenge my plan is to re-read the rest of the Alanna Quartet and then read all the rest of the Tortal universe books that I haven't read yet! I don't plan to re-read The Immortals Quartet for now, but who knows, it might change later in the year! As for the rest of the challenges I've made a handy GoodReads list/shelf! Have you read any Tamora Pierce books before? Do you want to join the challenge?? I have not read any Tamora Pierce Pili, so I'm looking forward to your reviews! And I hope The Force Awakens is everything you want it to be!!!!! You ought to join the challenge and maybe check out the Alanna quarter, they're super fast reads! Aw, yay :D Awesome challenge to take part in. <3 I haven't read any books by this author. But I own the Alanna ones :) One day. I hope you'll get to read all of these sweet girl. <3 And yay for seeing Star Wars :D I love how much you loved it. I still haven't seen a single movie about it, lol. Yaaassss, BB-8! I keep saying I need to show you my Star-Wars-related surprise THING - it involves that cutie! I'm hoping to see the movie when I go home! We'll see. I've not read anything by Pierce, so this is a great challenge! I won't be participating but I definitely plan on reading something by her eventually (her and Maria V. Snyder!). Cannot wait to see your SW surprise thing!! BB-8 is sooooo adorable in the movie too! I hope you'll like it as much as I did!! I've heard that the Alana Quartet is a classic must-read, so it's awesome that you're picking it up Pili! Best of luck! Elizabeth from So Long... & Thanks For All the Fish loves this author. I wonder if she knows about the challenge?